Canadian Peas, Milo, Popcorn, Maple peas, Austrian Winter peas, oat groats, graded american pigeon corn, white rice and white millet. Graded American Pigeon Corn, milo, wheat, canadian peas, Austrian winter peas and white rice. Not for sale in AL, FL, GA, IL, IN, KY, LA, MS, NC, OH, SC, TN, VA and WV. 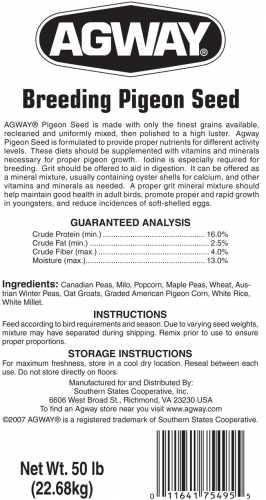 Agway Performance Pigeon Food made with only finest grades available, re-cleaned and uniformly mixed. 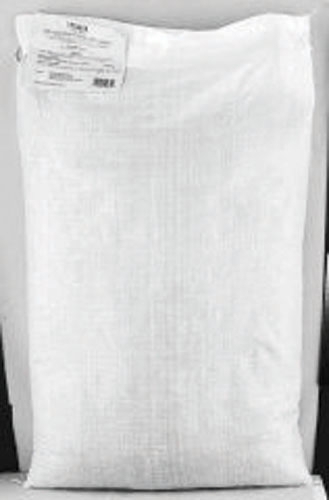 Graded American Pigeon Corn, Wheat, Canadian Peas, Maple Peas, Austrian winter peas, milo and white rice. Not for sale in AL, FL, GA, IL, IN, KY, LA, MS, NC, OH, SC, TN, VA and WV. 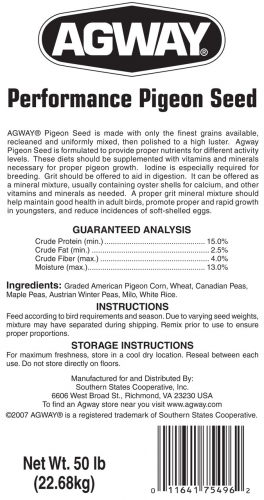 Agway Racing Pigeon Food made only with the finest grains available, re-cleaned, and uniformly mixed. 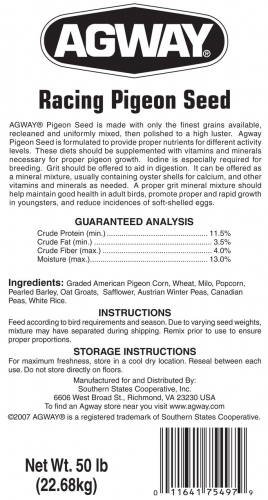 Ingredients include graded American Pigeon Corn, wheat, milo, popcorn, pearled barley, oat groats, safflower, Austrian winter peas, Canadian peas and white rice. Not for sale in AL, FL, GA, IL, IN, KY, LA, MS, NC, OH, SC, TN, VA and WV. 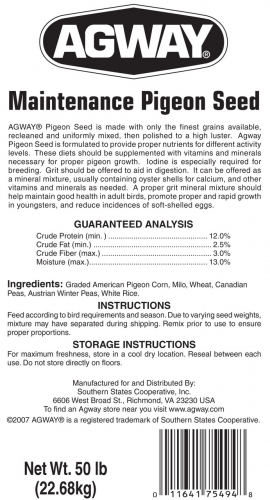 Pigeon grit is a scientific blend of essential dietary supplements needed for any pigeon: athlete, show, or enthusiast. Will stimulate digestive processes, as well as satisfy all dietary essentials.